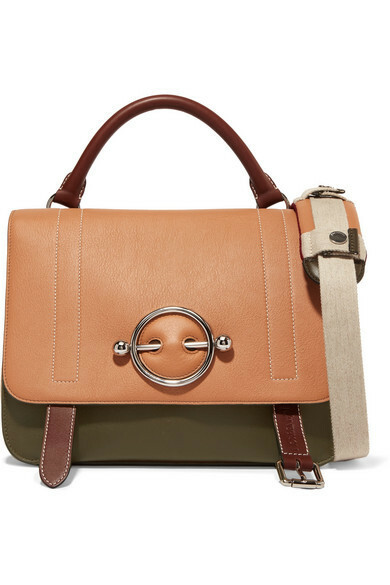 If you're obsessed with practicality dressing when it comes to your personal style, you'll love this adorable pairing of a beige coat and a JW Anderson disc color block leather and suede shoulder bag from NET-A-PORTER.COM. Kick up the cool of your look by completing it with white leather ankle boots. If you're obsessed with practicality dressing when it comes to fashion, you'll love this totally chic pairing of a black pleated midi dress and a JW Anderson disc color block leather and suede shoulder bag. Throw in a pair of tan leather wedge sandals to kick things up to the next level. 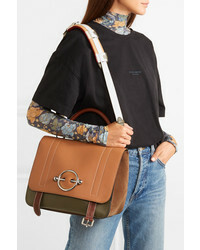 If you're all about being comfortable when it comes to dressing up, this combination of an olive parka and a JW Anderson disc color block leather and suede shoulder bag from NET-A-PORTER.COM is totally for you. 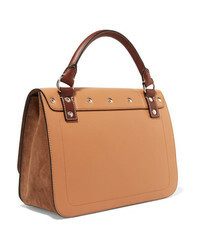 To add oomph to your getup, complete with black leather lace-up flat boots. Pair a tan blazer with a JW Anderson disc color block leather and suede shoulder bag if you're searching for an outfit idea for when you want to look casually cool. Sporting a pair of black leather pumps is a simple way to add extra flair to your getup. If you're a fan of practicality dressing when it comes to fashion, you'll love this chic pairing of a black off shoulder top and a tan leather satchel bag. Sporting a pair of grey suede ankle boots is an easy way to add extra flair to your outfit. Dress in a blue leather biker jacket and a JW Anderson disc color block leather and suede shoulder bag for an easy to wear look. If you're a fan of practicality dressing when it comes to fashion, you'll love this extra cute pairing of a white cable sweater and a JW Anderson disc color block leather and suede shoulder bag. You could perhaps get a little creative when it comes to footwear and dress up your getup with brown leather knee high boots. If you're obsessed with comfort dressing when it comes to fashion, you'll love this cute combo of a blue blazer and a JW Anderson disc color block leather and suede shoulder bag. Play down the casualness of your getup with tan leather pumps. Consider teaming a white embroidered button down blouse with a JW Anderson disc color block leather and suede shoulder bag from NET-A-PORTER.COM to get a laid-back yet stylish look. You could perhaps get a little creative in the shoe department and dress up your getup with black suede ankle boots.